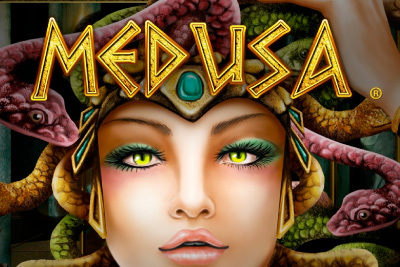 This Medusa slot game is based on the most renowned of Greek monsters, and possibly the woman with the most famous haircut in history, Medusa dares you to enter her lair and come and play. A NextGen Gaming slot that loses nothing from the transfer to mobile, keeping the same quality sounds and game play as the original desktop slot online. The slot itself could have used the whole screen rather than taken up space with large setting/sound icons, but at least game play is easy to use and you are unlikely to mistakenly move back to the home screen mid play. The Medusa slot machine has been around for a while, but age hasn’t weaned this lady’s charm. It’s a high to mid level volatility slot, so the bonus features are hard to hit, but when they come, they come with a bang. Equally, despite taking such a small part of the screen, you can’t deny that the video graphics are particularly impressive, especially for mobile slots. When the Expanding Wild symbol shows on screen even we were impressed by the beautiful display. That said, this real money slot doesn’t work on all Android devices, so test on free play first before you commit to spinning. We particularly loved the Free Spins feature which is generous and where you’ll get your big wins of the game – especially if you activate the Super Spins with x5 multipliers. The fact that Medusa mobile slot has the potential of a 5,000 coin jackpot (up to £/$25,000), doesn’t hurt her chances of being in our little black book of top slots either. You will find not one, not two but three bonus features in this Medusa game. Turn to Stone Re-Spins: The wild symbol is Medusa herself. Find her three times and she’ll use those snakes of hers to turn reels 2, 3 and 4 into stone. 1 of the reels will then proceed to crack and show you a gorgeous expanded wild graphic of the lady herself. This will set up 3 re-spins with the expanded Wild in play. These 3 spins are subject to a 3 times multiplier too which is great. Once Bitten Bonus: Activate this bonus round by getting 3 or more scattered logo symbols and you will be awarded 10 free spins with a 2x multiplier. Get the Soldier symbol on reel 3 during this bonus round (easier than you thing) and you will get up to 3 Super Spins. These are played after the normal free spins and come with a huge 5x multiplier. If luck is on your side, you can re-trigger an additional 10 free spins in the free spins game thanks to the scatter symbol. Pegasus Bonus: Triggered by getting 3 Pegasus symbols, this is a classic ‘Pick Me’ feature. Select one of the Pegasus symbols to win up to 50 times your bet. You can also get ‘Pick Again’ and ‘Win All’ prizes too. The Pegasus Bonus feature is the icing on the cake if you get it whilst in the middle of one of the other bonus rounds - 2x or 5x multiplier on the Pegasus Bonus gives you a big pot of cash from Medusas’ lair indeed. Decent bonus features and a tempting enough in-game jackpot of 5,000 coins gives this Medusa mobile slot a fighting chance against the more popular mobile slots out there. Probably one of the best of the NextGen slots range, this Medusa slot game looks beautiful on tablet and phone, even if we could have wished that they had used the whole space available. She is a little temperamental in how often she pays out, but given some time and attention, she will reward you with decent prizes.